German sociologist Max Weber introduced the word “charisma” into academic discourse, defining it in part as being a quality that sets an individual apart. Almost always, charismatic people posses exceptional communication and oratory skills. an A+, mastering skills that cannot be found in any other present-day Arab public figure. That explains why Hezbollah is so powerful and popular in today’s Muslim and Arab world. Recently, however, and although they are miles apart, Iraqi cleric Muqtada al-Sadr has been trying to copy what Nasrallah has achieved, in terms of organization, legitimacy and charisma, for his own military/political organ, the Mahdi Army. The Western media – alarmed at the growing influence of Muqtada and the British withdrawal from Basra at the weekend(where he is “king”), have started to fear the creation of a new Hezbollah in Iraq, mirroring that of Nasrallah. Reportedly, according to US journalist Seymour Hersh, Washington wanted Israel to destroy Hezbollah in 2006 to prevent the creation of Hezbollah-like groups in “failed states” such as Iraq. A close look shows that there are some similarities between the Mahdi Army and Hezbollah, but they are still a long way from becoming sister organizations – or even, mirror-image ones. Local conditions. The Shi’ites of both Iraq and Lebanon were an underclass for decades, inspiring both Muqtada and Nasrallah to take action to change that difficult reality. In Lebanon, although a numerical majority (1.37 million out of 3.7 million) they had less access to government jobs – and finances – than Sunnis or Christians. 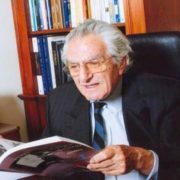 Before the civil war broke out in 1975, for example, when Lebanon was coined “Switzerland of the East” for its booming economy and high investment rate, Shi’ite districts received no more than 0.7% of the state budget. The same applied to Iraqi Shi’ites since the modern state was created in the 1920s. They had always been ruled by Sunnis, starting with their first king Faysal I and ending with Saddam Hussein. Before that, and like everybody else, the Shi’ites of both countries were ruled for 400 years by the Ottoman Empire, which was also Sunni. In Lebanon, the man to change Shi’ite standing was Imam Musa al-Sadr (a cousin of Muqtada), who created a party for Shi’ite emancipation in 1974 called the Movement of the Dispossessed. He then founded a military branch called Amal. There was no sole savior for Iraqi Shi’ites, although Muqtada’s father Mohammad Sadeq al-Sadr was a monumental figure in emancipating Iraqi Shi’ites. The young Muqtada took over after his father’s assassination in 1999, creating the Mahdi Army in June 2003. It stands today where Amal stood in the late 1970s. There was chaos in Lebanon, frustration among ordinary Shi’ites, Iranian influence, and plenty of arms to use for two purposes: 1) Protect Shi’ites from external violence 2) Fight the enemy. In 1982, it was the Israelis in Lebanon. In 2007, it is the Americans in Iraq. And to both leaders, political Islam has been on the rise for decades; it is the only trend that can control and continue to appeal to the Arab street. Secularism has been tried, and so has Lebanese and Iraqi nationalism. Both of them – as far as Nasrallah and Muqtada are concerned – have failed. Political Islam managed to bring about the toppling in Iran of Shah Reza Pahlavi, a friend of the US and the Israelis, in 1979. Two years later, it ended the life of Anwar Sadat, the man who signed peace with Israel. Both events were extremely important to Islamists like Muqtada and Nasrallah. Then came the performance of Hamas, a party founded on the principles of jihad and political Islam, in Palestine. Inspired by these events, Nasrallah started his new job in 1992 by promising to avenge the blood of his predecessor Abbas al-Musawi. In July 1993, Israel responded to Hezbollah activity with a seven-day offensive against Nasrallah. He responded by showering Israel with 142 Katuysha rockets. In April 1996, another war broke out between both parties – this time for 16 days – in which Nasrallah responded with 489 Katuysha missiles. The battle continued and led to the liberation of South Lebanon in May 2000; an event that by all standards had a very strong effect on Muqtada. He promised to do the same in Iraq after the Americans invaded in 2003, waging his own war against the occupants in 2004, inspired by the Nasrallah model. Both groups have managed to expand their powerbases to different parts of their respective countries, through a massive educational and social network of schools, charities, hospitals and mosques. Millions of poor people – grassroots Lebanese and Iraqis – rely on the Mahdi Army and Hezbollah for their livelihood. Nasrallah sends a monthly stipend to orphans, poor people and the families of those who have been killed in combat with Israel. In April 2003, Muqtada organized the Sadr Bureau, based on the Hezbollah model, providing services to poor people in Sadr City in Baghdad, ranging from health care to education, food distribution and clean drinking water. That has continued, and become all the more easier when the Sadrists gained control of the ministries of Health, Education and Commerce. One thing that Hezbollah posses and Muqtada lacks, however, is a strong media machine – al-Manar TV, with an viewership in excess of 10 million people worldwide. The station never portrays the Arabs – or Shi’ites – as defeated. All of Nasrallah’s propaganda shows victorious battles; footage of missiles hitting Israeli targets, or Hezbollah warriors returning home from combat in triumph. 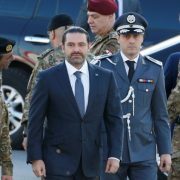 He insists that military operations are filmed in detail, to be used to win the minds and hearts of ordinary Lebanese. Al-Manar TV – topped with Nasrallah’s charisma – has done wonders for Hezbollah. 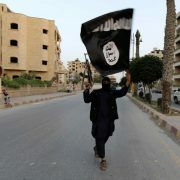 The Sadrists don’t have this propaganda weapon, but they could acquire it with the help of Lebanese experts and money. Early fame. Both men rose to fame at a very young age. Nasrallah became a member of the central military committee of Hezbollah at the age of 29, in 1989. That was only achieved after he led Hezbollah troops against his former patrons Amal, in Iqlim al-Tuffah (South Lebanon) during the Lebanese civil war. He projected courage and leadership and shortly afterwards, at the age of 31, became the secretary general of Hezbollah, after the assassination of his predecessor, Abbas al-Musawi. Nasrallah was born on August 31, 1960. Muqtada was born on August 12, 1973, and rose to fame in 2003, after the US invasion, at the age of 30. Elderly, more established clerics helped both men establish themselves in their respective communities. With Muqtada it was his father, Mohammad Sadeq al-Sadr. With Nasrallah, it was Mohmmad al-Ghrawi (the cleric who helped him continue his studies in Najaf), Mohammad Baqir al-Sadr (who took him under his wing when he was studying at the seminary in Iraq), and Abbas al-Musawi (whom he met in Najaf and with whom he later co-founded Hezbollah). After Nasrallah became a celebrity in Lebanon, his patron became Grand Ayatollah Mohammad Hussein Fadlallah. 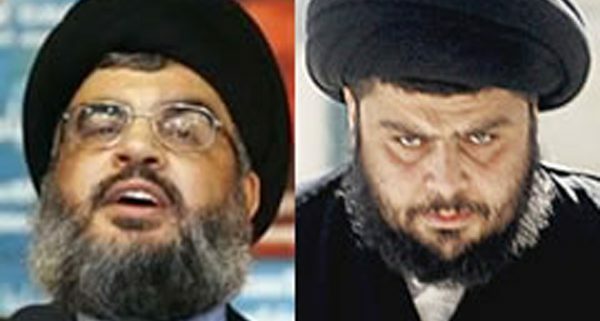 It took four clerics to promote Nasrallah, whereas it has taken only one – his father – to make Muqtada the man he is today. Both men came out of seemingly nowhere to challenge more established religious authorities. That often created envy, but within a remarkably short period, nobody in either Lebanon or Iraq could disregard Nasrallah and Muqtada. 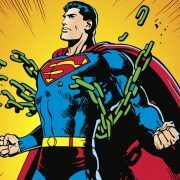 They became “king-makers” and enforced their will on others – using their strong characters, powerbases and the plenty of the arms at their disposal. Whereas with Muqtada, Saad al-Hadeithi, a political scientist at Baghdad University, explained, “The movement’s strength and cohesion don’t resolve around Muqtada alone. Muqtada is leading a movement that’s largely held together by the historical legacy of his father.” The one external factor that has helped both expand their legitimacy has been Iran. With Nasrallah it was then-president Ali Akbar Hashemi Rafsanjani. With Muqtada it is President Mahmud Ahmadinejad and Grand Ayatollah Ali Khamenei. Tactics. Since becoming secretary general of Hezbollah in 1992, Nasrallah has never resorted to violence when dealing with rival Shi’ites in Lebanon. Muqtada’s strategy is different, however. Some of his followers were responsible for the assassination of Imam Abdul-Majid al-Khoei in April 2003. An investigation implicated Muqtada personally in the assassination, and a warrant was issued for his arrest (although authorities at the time, fearing his influence, refused to advance a legal case against him). No warrant has ever been issued by Lebanese courts for Nasrallah. Naturally, Muqtada denies these charges, claiming the contrary; that he had sent men to protect Khoei. Nasrallah boasts of excellent relations with the Shi’ites of Lebanon, even those who are not members of Hezbollah. 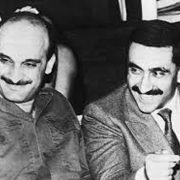 Originally a member of the Amal movement (lead by his current ally and former boss Nabih Berri), he was expelled for criticizing the dominating secularism trend in Amal, and its relative weakness in combating the Israeli invasion of Beirut in 1982. True, his men combated Amal militias in 1989, but Nasrallah never resorted to violence, target assassinations or revenge. Image projection. Both Nasrallah and Muqtada are very clear not to sound or act sectarian, in two countries where sectarianism is on the rise. Neither man mentions pan-Shi’ite loyalties, and always claim to be speaking either for Lebanon or Iraq. Both fully understand the multitude of the confessional system in their respective countries, and never call for the establishment of a Shi’ite theocracy, based on the Iranian model. They insist – at least in rhetoric – on the right for all Lebanese or Iraqis to live in peace, free from foreign occupation, while always safeguarding the rights of Shi’ites. Politics. Both leaders realize that maintaining a military group, without being part of the political process, is impossible. Muqtada originally shunned all collaboration with any US-backed government after 2003. He realized, however, that he needed to advance his program from within the government and legalize himself through holding government office. 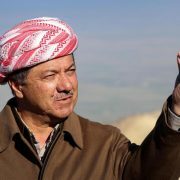 He joined the parliamentary elections, won 30 seats for his team and received major portfolios in the cabinet of current Prime Minister Nuri al-Maliki. Through them, he tapped money for his followers, offered protection, indoctrination, services and jobs. Education. After studying in Najaf in Iraq as a young man, Nasrallah returned to Lebanon in the late 1970s to teach at an Islamic institute founded by Abbas al-Musawi in Baalbak. He then went into politics and military affairs but realized that since he was becoming a Shi’ite leader in his own right, he needed to advance his academic and religious credentials. He had only spent two years studying at the Islamic seminary in Najaf, whereas his boss Abbas al-Musawi had spent nine years at the same institute. He cut short his military career in the 1980s and went to Qom, Iran, to advance his credentials, studying fiqh, kalam, hadith, tafsir, philosophy and Arabic literature. This realization – which hit Nasrallah at the age of 28, has just appealed to Muqtada, this December. Last week, he announced he has re-started his academic and religious journey, aimed at reaching the religious rank of mujtahid(Islamic jurisprudent), at the hands of the Afghani Ayatollah Mohammad Ishaq al-Fayyad, one of the most senior clerics in Najaf. Muqtada has not been seen in public since May, believed to be spending a lot of time in Iran, polishing his religious credentials. He started religious studies in 2000, but they were cut short by the US invasion of 2003. Currently, Muqtada holds the relatively junior title of hojatoleslam(the equivalent of a PhD if the title of ayatollah is equivalent to that of professor). He is not authorized to issue religious fatwas(edicts). The fact that he is a Sayyid (like Nasrallah) does not give him superior standing among Shi’ites. Likewise, he is also not at the level of mujtahid; when he is asked religious questions he must refer to clerics more senior than he is; a crippling reality to someone of his ambitions. When he reaches the rank of mujtahid, Muqtada will be “allowed” to teach books that he has mastered with his “supervisors”. He will then be allowed to publish them, answering questions on daily affairs related to Islam, and issuing his own fatwas. He will be able to issue edicts at will and will no longer have to blindly follow senior clerics, and people will start following him for religious leadership. At this stage of his educational standing, Muqtada must adhere to the instructions and orders of more senior clerics, like the moderate Grand Ayatollah Ali al-Sistani. Some people claim that at this stage he does not even hold the title of hojatoleslam, and that his followers refer to him as such out of respect. Others argue that he does, and plans on becoming not only a mujtahid but an ayatollah in his own right – presumably by 2010. To reach that level, he must produce a manual of ritual and legal practices for ordinary Shi’ites and get the approval of other senior clerics in the Shi’ite community. What helps him is the residue of his father’s connections and the fact that he is a descendant of the Prophet Mohammad. Cole then notes that people might start calling him “ayatollah” before (if) he reaches the honorific title. In addition to educating himself, Muqtada has started to purge his Mahdi Army from undisciplined young men who have used his name for personal gain since 2003. A filtering process has began, where all those unfit for Sadrist affiliation will be expelled from the Mahdi Army. Members have to have – according to Muqtada – a high moral fiber, a strong religious education and a willingness to work with all parties to advance stability for Iraq and liberation from US occupation. His senior militiamen have been ordered to take Islamic lessons three hours a day, five days a week. Only those who pass seminary exams will be allowed to remain in the Mahdi Army. By Iraqi standards, Muqtada is a charismatic young man, although many in the Arab world would disagree, and when compared to Nasrallah he scores poorly. 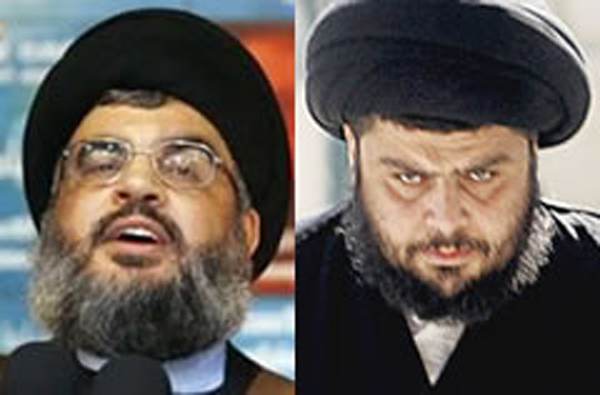 Slightly more than 10 years his junior, Muqtada looks up to Nasrallah and sees him as a role model. That is a fact. Reportedly, the two men are good friends, although there is no record of any encounters between them, or any photograph or visual material proving that they have ever met.